Wearing socks with sandals has long been a fashion faux pas. But not anymore, my friends. 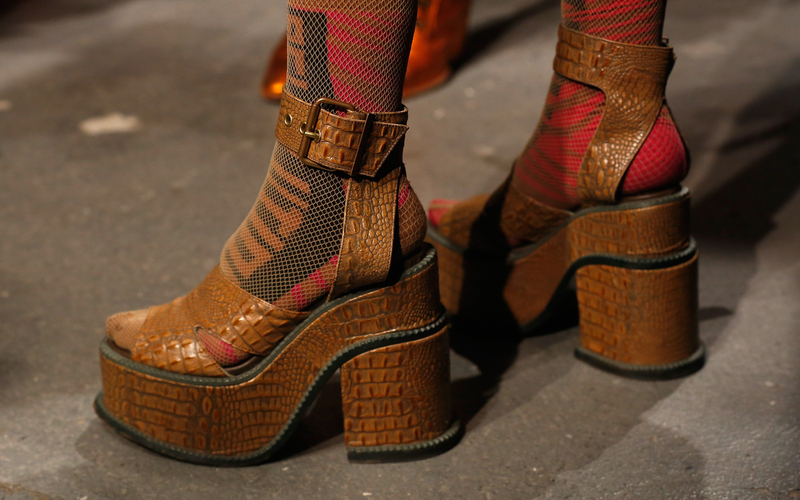 The design houses of Hermes, Burberry, and the like have justified the socks and sandals combo on the runway. The thing is — even if you don't buy into trends, there are still plenty of reasons to try this once-taboo style. One being that it just kind of makes sense doesn't it? Why limit those cute sandals to the warm weather, when you can just wear socks to rock them in the colder months? And what's even the point of having all of those fun and fancy socks if you never get a chance to show them off? Well after all of these years, I'm finally game. In case you are too, but aren't quite sure where to start, here are 10 socks and sandals combinations that will totally make an outfit. And yes, every type of sandal has an ideal sock pairing. So regardless of your preference in shoes (or socks), whether you like strappy sandals, platforms, or even Birkenstocks; frilly socks, knee-highs, or knitted socks; there's a combo that will totally convert you to the socks + sandals lifestyle. Yeah, I was surprised, too. Knee highs paired with chunky sandals is a classic combo. So amp it up by opting for graphic prints and bright colors. A pretty pattern like florals or snake print peeking out through fringe is everything. The texture of crochet or knitted socks paired with the simplicity of a Birkenstock gives such a comfy-chic look. Bright colors and fun prints are a playful juxtaposition to the sexiness of caged sandals. Dainty, netted socks pair perfectly with bow-accented sandals. Play with the lines of strappy sandals by adding a pair of plaid socks. Frilly socks add a sweet touch to the more casual-nature of flat sandals. Slouchy socks contrast the lift from platform sandals, and make this combo appear effortless. Color-blocked socks mean that a different color can peek out from each opening in slingback sandals. Suede and lace are such a pretty pair. And little frills poking out from ankle straps is the cherry-on-top of this feminine look.